25th December 2014 : Singapore to Melbourne – The flight was decorated with mistletoe and holly and in the middle of service, flight attendants pinned snowflake shaped brooch to their uniforms. “As a part of our special Christmas Menu, we have turkey today! Would you like to opt for that, Ma’am?” I was asked by the flight attendant, with immense hope and expectation, as if there was some tacit Christmas turkey consumption target, she had to meet and my choice of meal would greatly affect her cause. No thanks. I’ll stick with chicken I said and tried to smile as bright as her. I really tried. “How about you Sir?”, she moved on. ‘Ummm..what the heck..I’ll try the turkey!’ said my husband with enough benevolence for both of us. 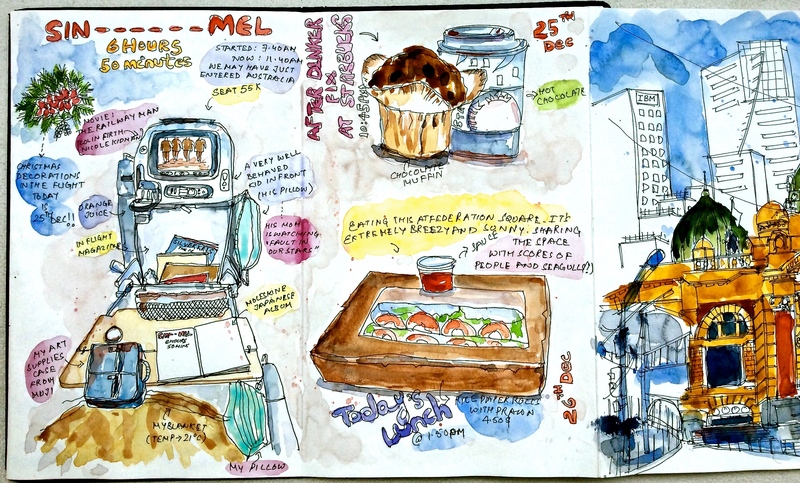 25th Dec + 26th Dec/ Melbourne : Inflight sketch from from my seat; Hot chocolate and muffin at Starbucks; Rice paper rolls bought on Flinders street consumed at Fed Square with seagulls and people. In the evening, we jostled against hundreds of people to watch the Christmas light show projected on Melbourne’s Town Hall, had great dinner, clicked some praiseworthy photos of Flinders station, sipped warm coffee and munched on deliciously fluffy chocolate muffin at Starbucks. If the first day on the trip is any indication of what’s to come, we were pretty optimistic. Then, came the abrupt uncalled for, unprepared for rain right after the coffee people shooed us away at closing time. Without umbrella and jackets, we shivered in the cold under the shop’s awning in the peak of Australian summer, and after a very long wait, deep in the throes of the night with hobos and drunk for company, we finally trudged back to the hotel in clumsy rain soaked shoes. Karma caught up with me. I should’ve accepted the turkey. And with grace. 26th December 2014: On our Own – As much as I love the Indian cricket team, I didn’t accompany my husband to the famous Boxing Day Test match between India and Australia held at Melbourne Cricket Ground. While my husband walked to his pilgrimage early morning, I set out to soak the city, explore, observe, experience and make impressions. It was a day with no itinerary and no agendas. I perched on the steps of St. Paul’s Cathedral and watched a sea of people, cars, trams criss crossing each other at the traffic signal. 26th Dec / Melbourne : Flinders Station sketched from the steps of St. Paul’s Cathedral. It was extremely breezy. I had a hard time holding on to the paper. When my interest waned, which was by the time I finished this sketch, I crossed the road, bought myself some Vietnamese lunch from a Flinders street eatery and came back to Fed Square to finish it. The seagulls begged and begged for scraps but I was too hungry. The inimitable Immigration Museum consumed my entire afternoon and in the evening I went back to the same Starbucks for coffee and was quite pumped when the lady at the counter got my name right the first time. That instantly erased memories of the night before. 26th Dec / Melbourne : Right in front of the Starbucks was a green patch where stood this giant Christmas tree which everybody queued to take pictures with; Greek Dinner in the heart of Greek precinct was chicken and lamb souvlaki with pita and beetroot dip. Having checked off one of the items on his bucket list, my husband joined me for sumptuous Greek dinner at DION. Between mouthfuls of souvlaki and pita, we talked about our day and tried to prove which one of us had a better time. 27th December 2014: Initiation to the Laneways – Vicolino Cafe on Degraves Street served the most surreal Egg Benedict I had ever tasted in my life. 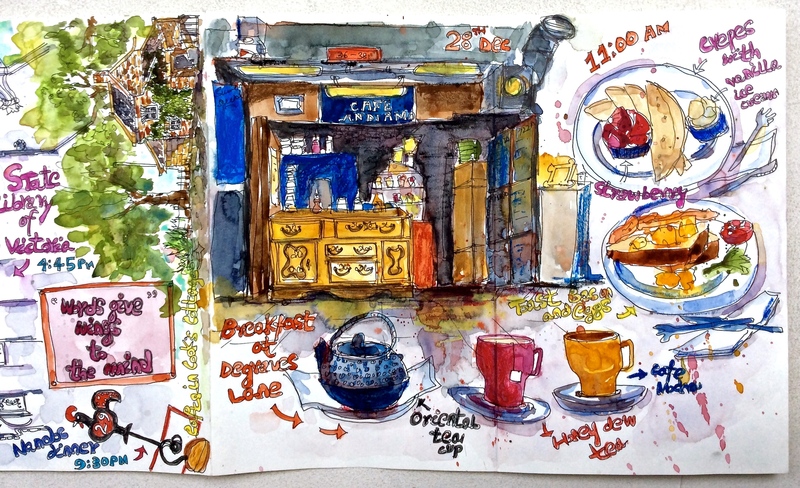 This breakfast perked me up so much that I immediately landed a detailed sketch of a creperie right opposite Vicolino in my sketchbook, while shuffling on the tiny stool I was perched on, in the cramped corner of a grungy back lane riddled with graffiti, exposed wires and torn posters. It was unconventionally atmospheric and an unkempt tipsy man slinking through the shadows with his beer bottle fitted the scenery seamlessly. Reams of tourists and locals streaming in and out of the narrow cobbled street, eating, drinking, shopping, people watching, fed to the palpable energy. We kept coming back like hopeless addicts. 27th Dec / Melbourne : I sketched this cute eatery called ‘Creperie’ while having breakfast at Cafe Vicolino on Degraves Street; a portion of the magnificent La Trobe Reading Room was tackled inside the State Library of Victoria; a tiny Captain Cook’s Cottage in the extreme right was sketched in the late evening under the tall shadows of English Elms. Part of the day was spent admiring the fabulous octagonal La Trobe Reading Room in the State Library of Victoria. Ever since I read Pico Iyer’s insightful article ‘Shelter from the storm’, where he says, “..one of the best places to visit in any new city is the library”, I’ve been actively frequenting these emblems of stillness. Imagine cozying up to a musty smelling tome on a period reading table fitted with bottle green-reading lamps, under a spectacular white dome! I was wielding a sketchbook, but it had the same effect. By the time we ambled through the splendid Fitzroy Gardens and arrived at the doorstep of Captain Cook’s Cottage, nobody was home. It was way past visiting hours. But the silky grass, the lulling breeze and the slanting rays of the golden sun causing the stately English Elms to cast tall sombre shadows called for a brief stopover. 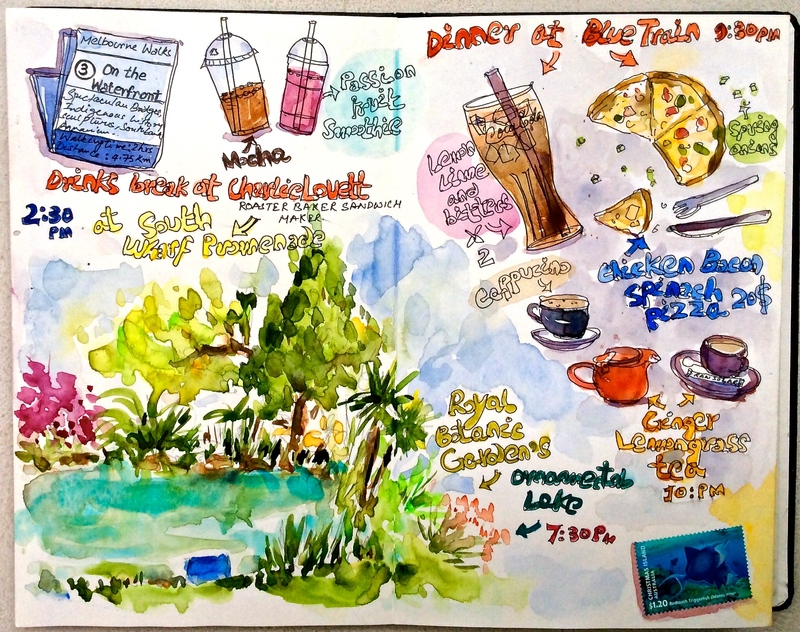 I captured some memories on paper before ending the day at Nandos. I sketched our food order number, which was 29, while listening to our neighbours blithely discussing their recent trip to Singapore. They sounded very pleased. 28th December 2014: Away from the CBD – Starting the day with a Laneway breakfast was a no brainer! 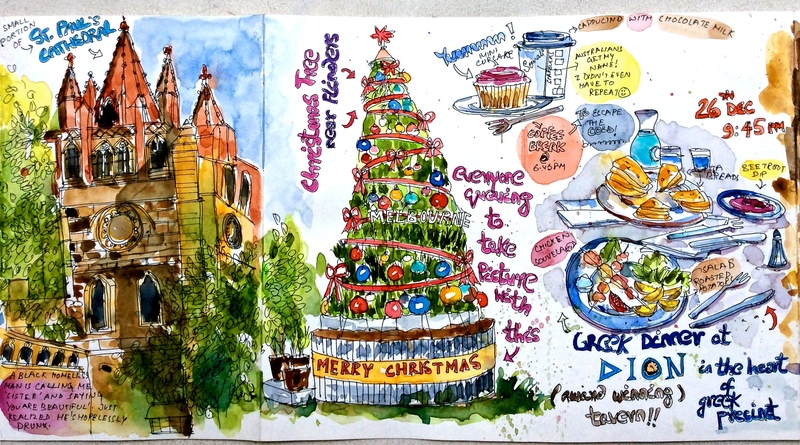 Back on Degraves, Cafe Andiamo served the most scrumptious crepes with strawberries and vanilla ice-cream that melted by the time I finished my sketch. Well, the day was hot. And by the time we finished a 2 hours walk along the waterfront from Southbank Promenade to South Wharf along the Yarra, we were cooked and toasted by the blazing sun. A very long ‘passion fruit smoothie’ break later, we landed ourselves on a silky green patch of land beside the Ornamental Lake in Melbourne’s Royal Botanic Gardens, where I sketched this scene because sometimes you’re so overwhelmed with what you see, you need to express your joy and gratitude in some way. The evening was quiet except for the screeching of the cockatoos. It was getting colder, pleasant actually. I took my shoes off and rubbed my feet on the grass, releasing a raw earthy smell. A slanting golden light coloured the trees, plants, bushes and shrubs of variegated foliage, arranged like little jewels along a turquoise lake, that held their reflection in absolute stillness. It was one of those rare moments when you sense a primordial connection with your environment. Dinner was at Blue Train, back at Southgate promenade, which was now teeming with evening strollers and joggers. The lesson that I took away from eating here, was to garnish my future homemade pizzas with spring onions – it makes a phenomenal difference! 29th December 2014: Taking it easy – Just when I thought nothing could top my love for the stately English Elms of Fitzroy Gardens, we found the conservatory. It is one happy rendezvous of plants and flowers in all kinds of shapes, sizes and colours, arranged in pleasing designs. There are empty cages hanging from the top, a tiny bridge with railings at the centre and old fashioned benches for people to rest and take photos. Soft muted light streams in through the beautiful arched transom windows. Obviously I sketch. Lunch was at Cumulus Inc. at nearby Flinders lane and I cannot say this enough – If you’re ever in Melbourne, eat here at least once. Unparalleled customer service (which seems to be the norm in Melbourne, though) pales in comparison with the food. Your taste buds will experience a firework of flavours. Probably this should be their tagline. 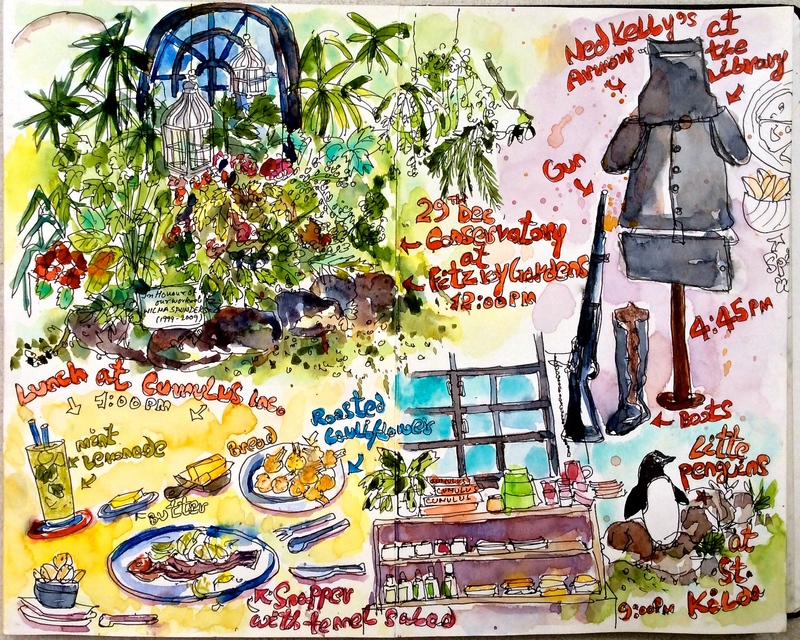 29th Dec / Melbourne: While I was sketched in the conservatory, an old British couple breathed over my neck. They were pretty intrigued by what I was doing and while leaving said. “You’re a clever girl, aren’t you?”. Ahh..ummm..mmm..I’ll be better prepared next time. St. Kilda’s Pier hogged our last evening in Melbourne. We strolled hand in hand (more so coz I needed something to cling on to) on the historic pier with waves crashing on either side and the wind throwing us off balance. It was an exciting change from what we’ve been doing past four days. The day ended with an intensely golden sunset and the sight of penguins swimming to the shore at dusk. This entry was posted in Daily Vignettes and tagged Antipodes, Australia, beetroot dip, Blue Train, Cafe Andiamo, Cafe Vicolino, Captain Cook's Cottage, Charlie Lovett, chocolate muffin, Christmas, Christmas Tree, coffee, conservatory, Creperie, Cumulus Inc., Degraves Street, Dion, Egg Benedict, Fitzroy Gardens, Flinders Street Station, Greek dinner, Greek precinct, hot chocolate, illustrations, La Trobe Reading Room, Laneways, Little penguins, Melbourne, mistletoe and holly, Nandos, Ned Kelly, Ornamental Lake, pita, Royal Botanic Gardens, sketch, South Wharf, Southgate, souvlaki, St. Kilda Pier, St. Paul's Cathedral, Starbucks, State Library of Victoria, Town Hall, Travel, turkey, urban sketching on January 30, 2015 by Somali Roy.